I've greatly appreciated the New Super Mario Bros. series for introducing the greatness of 2D Mario to a new generation of gamers while improving the experience for long-time fans by introducing fun new wrinkles. New Super Mario Bros. U exemplifies this better than any other game in the series with a variety of fun tweaks and additions that kept me hooked in a way that hasn't occurred in a Mario sidescroller since Super Mario World. As the Wii U's inaugural Mario platformer, it's the first HD Mario game and the Mushroom Kingdom has never looked better. From the super-clean character models and beautifully layered backgrounds to little touches such as light sources on fireballs, this easily one of the best-looking games on the Wii U. My favorite stages included a next-gen rendition of Mario 3's Giant World and a haunted swamp that featured a charming crayon art-style similar to Yoshi's Island. The world map is huge and several stages contain multiple exits that lead to hidden levels including the appearance of a fan-favorite world upon completing the game. There's so much to find that you'll be uncovering secrets long after you've triumphed over Bowser. Miiverse lets you post messages about stages from helpful hints to vents of frustration and posts from fellow players can be displayed on your map. 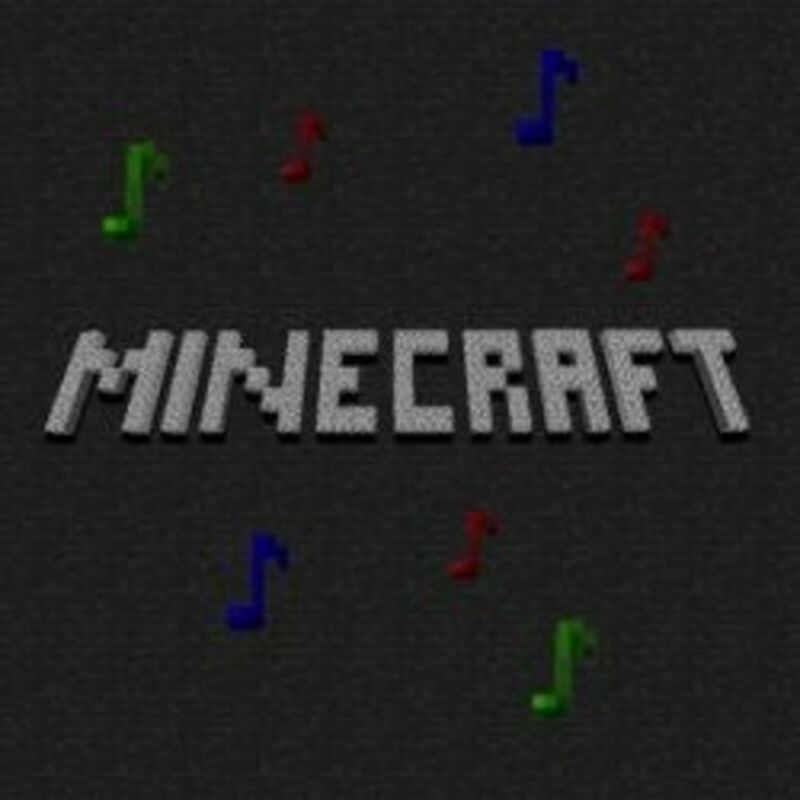 Worlds are still mostly categorized by standard types like forest, ice, desert, etc. 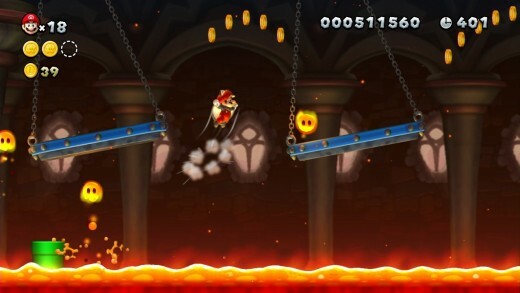 but many stages feature unique elements and gameplay mechanics that make them stand-out. One area tasks you with staying on a roaming wiggler as it stomps through deadly goop. Another stage is filled with perilous see-saw platforms and one underground level is made up of massive gemstones that shift positions as you go. 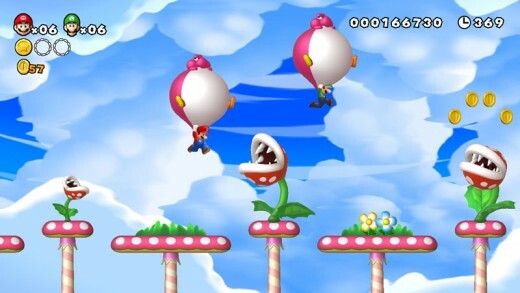 One-off enemies, such as a massive sea serpent in one underwater zone, also help give stages their own identity. Boo houses return and are as tricky as ever with fiendishly clever puzzles and illusions. 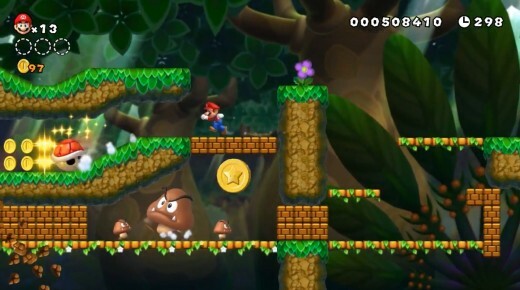 Many levels provide a level of difficulty not seen in a 2D Mario in some time. I found myself dying much more often than I'd expected (the later worlds can be especially trying) but this was due properly designed challenge and my own mistakes as opposed to straight-up cheapness. 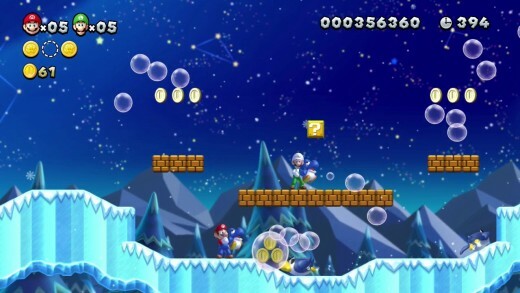 Veteran Mario players will adore NSMBU's renewed emphasis on challenge. The big new power-up this time around is a flying squirrel suit that grants Mario and Co. the ability to glide long distances and cling to walls. Like the tanooki suit and cape before it, the squirrel suit is incredibly useful for breezing past difficult platforming sections but the lack of an attack keeps it a step below it's predecessors. Nabbit, a thieving rabbit, is a new antagonist that periodically appears in random completed zones that you can chase down to earn extra power-ups, making it a fun way to beef up your inventory. Baby Yoshi make their return after a long hiatus and sport cool new abilities. Blue yoshi belch bubbles that trap enemies, glowing yellow Yoshi illuminate pitch-black sections, and pink Yoshi inflate themselves into reptilian balloons. Unlike Super Mario World, the babies won't grow up after devouring everything around them, but big Yoshi is on-hand for some classic dino thrill. As always, co-op is chaotic fun (though it's irritating that Nintendo stuck with two generic toads instead of four unique characters) and the GamePad allows a fifth player join the fray. This extra player uses the touchscreen to create platforms that can help players by saving them from pitfalls or assist in reaching out-of-reach areas. 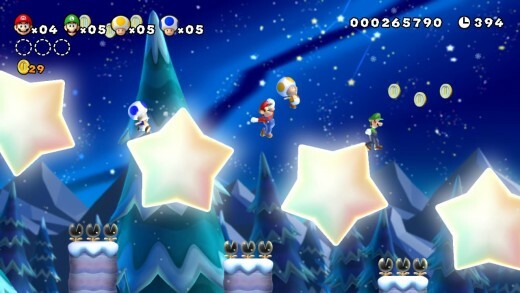 The GamePad player can also stun enemies by tapping the screen and reveal hidden secrets, like the returning crescent moons, which are only visible on the second screen. 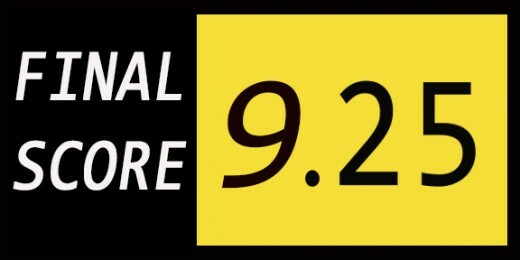 It's a great option for players less skilled at platforming but still want to enjoy the game. 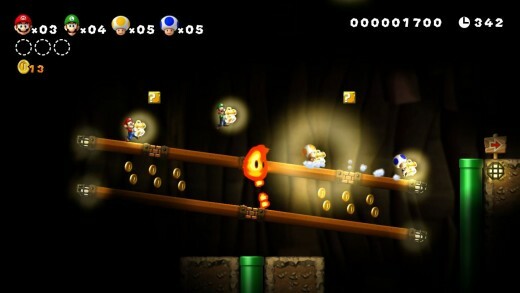 Outside of the main game, entertaining distractions include Challenge mode, which issues goals such as clearing a stage quickly, and Boost Rush challenges players to quickly finish a stage as the level scrolls faster with each coin collected. 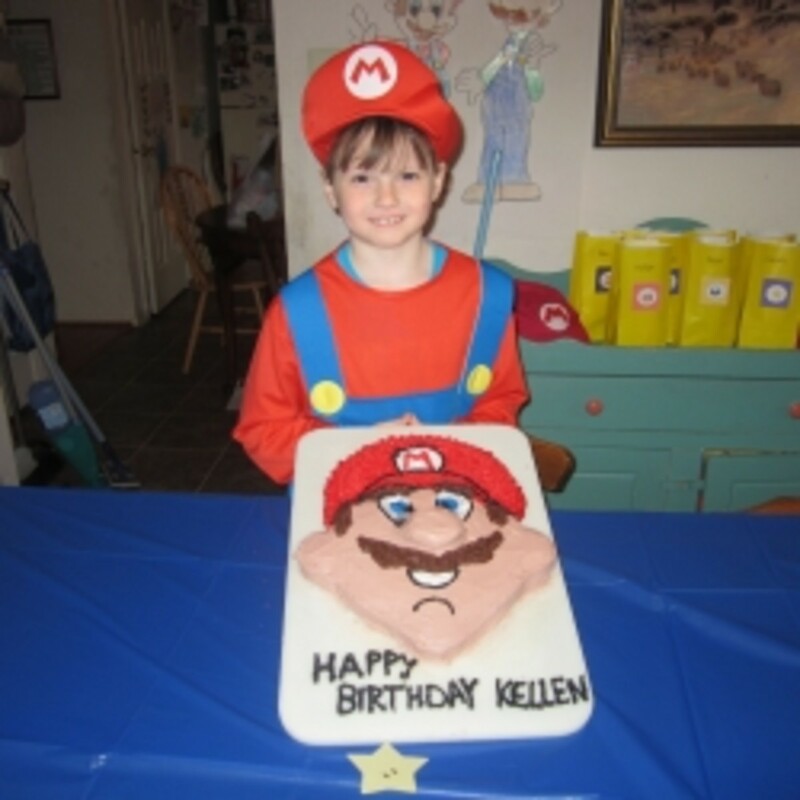 Mario games are revered for their perfect controls and that remains true regardless if you play using the GamePad or Wiimote. Mario U can be played entirely on the former, turning a great console experience into an equally enjoyable handheld venture. New Super Mario Bros. U may not reinvent the series like Super Mario Galaxy did on the Wii, but it's another fantastic entry in a series full of them.